The Hogan Law Firm is pleased to announce that Jennifer C. Rey has rejoined the Firm as an Associate. Ms. Rey returns to the Firm and the Brooksville area after nearly four years of living in Wyoming. A Florida native, Ms. Rey previously resided in Brooksville for 25 years. 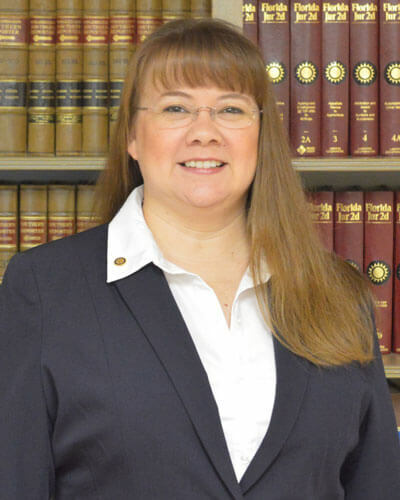 She will provide counsel to clients in the areas of corporate law, business transactions, and employment law from the Firm’s Brooksville and Spring Hill offices. She earned her Juris Doctor degree in 2007 from Stetson University College of Law. She is currently admitted to practice in Florida and Wyoming, including the U.S. District Court for Wyoming, and the U.S. Court of Appeals for the Eleventh Circuit. Ms. Rey holds a bachelor’s degree in Human Resources Administration from Saint Leo University, and an MBA in Business Economics & Public Policy from The George Washington University in Washington, DC. She holds professional certifications as a Senior Professional in Human Resources (SPHR) and Global Professional in Human Resources (GPHR). Ms. Rey has litigated wage and hour, FMLA, wrongful termination, performance and payment bond, trade infringement and various contract dispute matters for corporate, not-for-profit and government clients. She has represented clients and employers before the National Labor Relations Board, Equal Employment Opportunity Commission, Department of Labor, Public Employee Relations Commission, Florida Board of Education, Florida Agency for Workforce Innovation Unemployment Division, and the U.S. Department of Education Office for Civil Rights. She served as a litigation intern with the U.S. Attorney’s Office for the Middle District of Florida and interned with the in-house counsel office for Tech Data Corporation, a Fortune 500 company and one of the world’s largest IT product distributors. Prior to her law career, Ms. Rey held a variety of executive and professional human resource management positions, including serving as chief human resource officer and compliance officer. She has worked in small business, economic development, local government, and not-for-profit environments. For more information, please contact Lisa Morgan at lisa@hoganlawfirm.com or at 352-799-8423.